It’s Cinco de Mayo, or, a happy birthday, or, a laid back wedding reception, for your festive day why not consider a feast with a complete Taco bar. Lay out your table with colorful Mexican table decor, delicious food of Mexican or International Taco, salads and all the accompaniments then have some fun. The following recipes is specially prepared for a niece and her wedding for 100, so recipes are given in quantities of 8, 20 & 100, venture out and make your party delicious. It is not likely you will find yourself short of food, and leftovers can easily be stored or even frozen for later use. Be sure to follow all “food safe” rules when placing food out buffet style, five simple rules and your guest are kept safe and you can sleep sweetly. Keep it clean, wash everything, hand, cutting boards, utensils, preparation areas, make a simple sanitizer for all surfaces of 1/2 cup white vinegar, 1 cup of water, 5 drops of Lemon essential oil, this is a natural sanitizer, a chemical one that is completely safe is 3 tablespoon bleach in 4 cups water, place both in spray bottles and use as required. Track your time, standing food can attract unwanted unfriendly’s, so keep track of how long you allow food to sit during the service, 2 hours is max even when following rule 2. Avoid possible mix ups, any raw food (crudite) should be kept away from cooked foods, have a proper serving utensil for each featured item, on each side of your service table, and don’t leave the utensil in the food in service. Leaving with the leftovers, discard any perishable foods on the buffet that has been at room temperature for two hours or more. Divide your into smaller portions or pieces, place in shallow containers, and refrigerate. Hold in the refrigerator, then only for three to four days at most. Freeze whatever you can that will not be consumed within those few days afterward. Just a quick look at what you may need, it is subjective, however, as some may eat more or less depending on many factors, a very informal event like a Superbowl party more food will be consumed, an event where guests dress in more formal attire tend to see less hand held food consumed. Here is a look at what you may need to help you budget. Keep in mind that if your offering various types of Tacos make only that which is required, for example for a party of 20 make one batch each of Chicken Tinga and Pork Carnitas and two of Beef. You certainly wouldn’t make a batch for 20 of each, unless of course you desire a lot of leftovers. Sauce: Heat a large skillet over medium. Once warm, add the oil and onion. Sauté for 4 minutes or until tender, stirring occasionally. Add in the garlic and cook for 30 seconds more. Stir in the oregano, and cumin, and toast for 1 minute. Add in the tomatoes, stock, and salt. Bring o a simmer, and cook for 7 minutes. Mix minced onion, salt, chili powder, cornstarch, cumin, red pepper flakes, cayenne pepper, dried minced garlic, and oregano in a bowl. Heat a large skillet over medium-high heat. Crumble ground beef into the hot skillet. Cook and stir until the beef is completely browned, 7 to 10 minutes. Drain and discard any excess grease. Return ground beef to heat. Pour seasoning mixture, water and hot sauce over the beef; stir to combine. Bring to a simmer and cook until the moisture absorbs into the meat, about 5 minutes. Taste and adjust the seasoning to taste. Place the pork on a cutting board remove the rind, cut into 2-inch cubes. Add tomatillos, remaining onion quarters, remaining garlic cloves, and jalapeños to the saucepot with strained pork liquid. Add water until it is about 1-inch below the top of the vegetables. Bring to a boil over high heat, reduce to a simmer, and cook until all vegetables are completely tender, about 10 minutes. 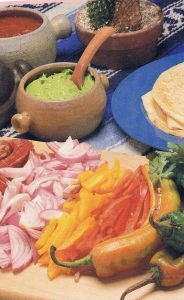 Blend salsa with hand blender or in a stand-up blender until smooth. Season to taste with salt. Allow to cool and refrigerate until ready to use. 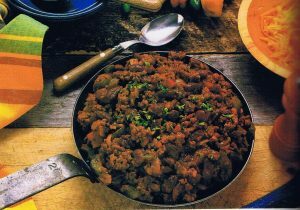 To serve: Place casserole dish with pork 4-inches under a high broiler and broil until brown and crisp on the surface, about 6 minutes. Remove pork, stir with a spoon to expose new bits to heat, and broil again for 6 more minutes until crisp. Tent with foil to keep warm. * Queso Fresco “fresh cheese” is a Mexican cheese, traditionally made from raw cow milk or a combination of cow and goat milk, use Goat cheese, feta or Ricotta. In mixing bowl, combine all ingredients and well combined. Refrigerate for 30 minutes before serving. Using a spoon, scoop the flesh of the avocados into a low serving bowl, discarding any bruised, browned areas. Using a pastry cutter, potato masher, or fork, mash up the avocado until it reaches your desired texture (I like my guacamole to have some texture, so I stop mashing once there are just small chunks remaining). Promptly add the onion, cilantro, jalapeño, lime juice, coriander, and salt. Stir to combine. Taste and add additional salt and or lime juice if required. In a large pot, add in the dried pinto beans, yellow onions, dried oregano, salt and black pepper. Add in enough water to cover the beans at least two inches or more. ally, until jalapenos begin to soften, about 5 minutes. Add in beans and cook for 2 more minutes. Add 1 cup of the reserved bean water and mash the beans to form a chunky paste using a bean masher or a potato masher. If you like your beans completely pureed, you could use a handheld or regular blender instead of a bean masher. Reduce heat to medium and cook, stirring until the beans reach your desired consistency. Add more water one tablespoon at a time if you like your refried beans thinner. Taste, season with salt if necessary and serve. This recipe calls for using half of the cooked beans, which totals about 6 to 8 servings. If you’d like to use all the beans to make a huge batch of 12 to 14 servings, set aside 2 cups of the reserved bean water and double the amount of olive oil, garlic and jalapenos used. When reheating the beans on the stove or in the microwave, add a tablespoon of the reserved bean water (or vegetable stock) to help keep the beans moist. The refried beans will last about a week in the fridge. Freeze in freezer bags. Turn off heat, fluff rice, then let sit, covered, for 5-10 minutes before serving. In a large mixing bowl, mix the first 9 ingredients together. Parboil the potatoes, drain and place in a large pan. While the potatoes are hot, sprinkle them with the pickle juice, cool to room temperature., then drain after they have cooled. Mix the potatoes with the wet mixture and allow to cool covered in the refrigerator before serving. Puree the garlic, anchovies and Dijon in a the food processor mix until smooth. Place the mixture and the egg yolks into a the mixer with a whip attachment and very slowly add the oils processing until smooth and thick. Gently blend in the remaining ingredients. In a Dutch oven or a large kettle heat the oil, add the beef and fry, then drain the beef, reserve. Add the celery, peppers and onions to the pan, sauté until tender. Stir the beef back in and add the beans. Add the tomatoes, broth, juice and seasonings. Bring to a boil. Reduce heat and simmer for until the desired thickness (some enjoy a thin soup others a thicker stew style) Pour chili into bowls, garnish with tortillas and cheese and serve. In a small saucepan, heat the olive oil over medium heat. Add the onions and garlic and cook for 3-4 minutes, just until the onions begin to soften. WARMING POTATO SOUP FOR WINTRY DAYS. In a Dutch oven, cook the bacon over medium heat until done. Remove bacon from pan, and set aside. Drain off all but 1/4 of the bacon fat. Cook celery and onion in reserved bacon drippings until onion is translucent, about 5 minutes. Stir in garlic, and continue cooking for 1 to 2 minutes. Add cubed potatoes, and toss to coat. Saute for 3 to 4 minutes. Return bacon to the pan, and add enough chicken stock to just cover the potatoes. Cover, and simmer until potatoes are tender. In a separate pan, melt butter over medium heat. Whisk in flour. Cook, stirring constantly, for 1 to 2 minutes. 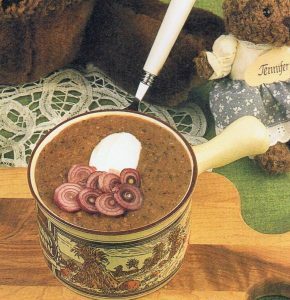 Whisk in the heavy cream, thyme, and parsley, bring the cream mixture to a boil, and cook, stirring constantly, until thickened. Stir the cream mixture into the potato mixture. Puree about 1/2 the soup, and return to the pan. Adjust seasonings to taste. 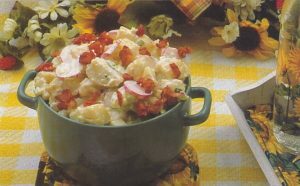 Place soup bowls, garnish with cheese, scallions and sour cream. Optional garnishes more cooked bacon bits.